Pilau is a hearty dish made from deep fried meat and vegetables, over which rice is cooked. 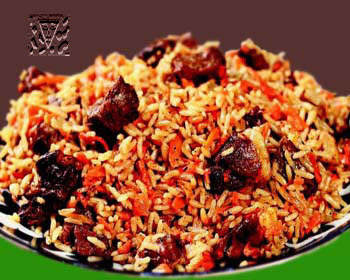 Pilau is considered a national dish in many countries of Central Asia and the Near and Middle East. It is generally popular over most of the area that the Soviet Union once covered and more. The Turkish saying says of : there are so much types of pilau, how many cities are in the moslem world. The Kazan pilau is most widespread in Tatarstan. To sort out rice, wash several times by hot water and to cook to semireadiness. In a shallow caldron to melt oil or fat, put there cut by small blocks or bars the boiled meat (mutton, beef or young horseflesh), on him are groups of carrot and onions. On vegetables to put the rice cooked to semireadiness, add a bit clear soup and, not mixing, on 1-1,5 hour to put on a weak fire in the closed tableware. To lay out the prepared pilau in a large dish or it is possible to give to each in a separate dish. Before a serve in a pilau add the raisins, dried apricots without stones. Meat - 200 g, rice - 65, oil melted - 30 g, onions - 24 g, carrot - 20 g, raisins or dried fruit - a 30 g, salt, pepper to liking.